b) Many others have beaten me to it with much more impressive designs and skills. 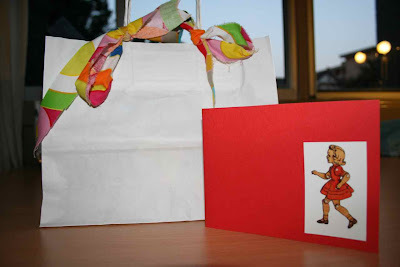 However, I still like to give it a go as gifts for family and friends' little ones. It makes giving more fun and people generally genuinely appreciate something that has been especially handmade. I am way behind on a few gifts at the moment, but I'm heading up to Brisbane later this week to catch up with family and friends, including a new little one, so a forced deadline spurred me into action. I've had this bright and fun Ikea fabric sitting in my collection for a little while now. 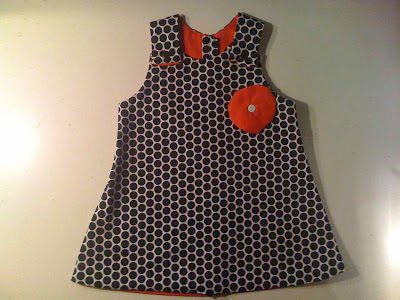 I figured it was perfect for a simple, fun little girl's dress. I used some of the off cuts as part of the wrapping too, and made a card using a cut out from a Love flyer/ postcard I had lying around. This one above was another recent present for the daughter of a friend who is a something of a rock snob (I mean that in a good way), so I figured a "kindie rock" look was in order. 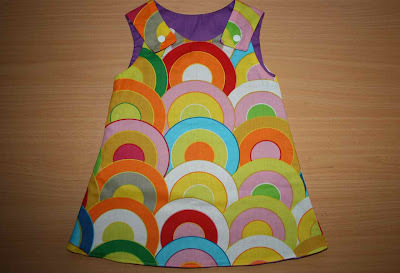 They are very simple dresses, just using a commercial pattern that I've tweaked a little. I've got a pattern for overalls for little boys that I want to have a crack at sometime soon too. I must say, while there seems to be a bit of a resurgence of cool and cute little girls' gear at design and craft markets, the boys tend to miss out. I am just as guilty! 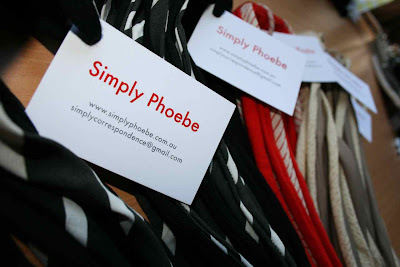 In other news, I'm sending off my first retail order for the Simply Camille range today! Exciting stuff. Will post a note soon with details on the shop they are heading to.